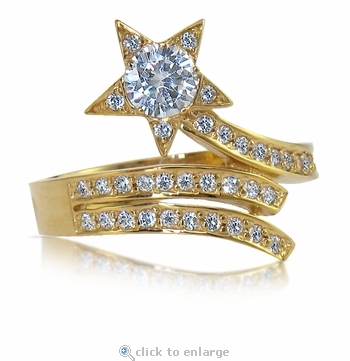 Our Shooting Star Round Pave Cubic Zirconia Ring is whimsical and fun. 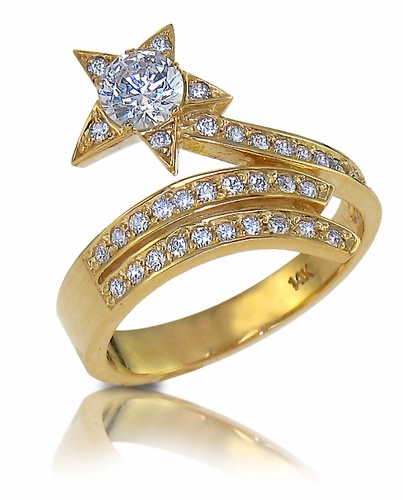 This diamond quality cubic zirconia ring features a shooting star design that wraps around your finger. 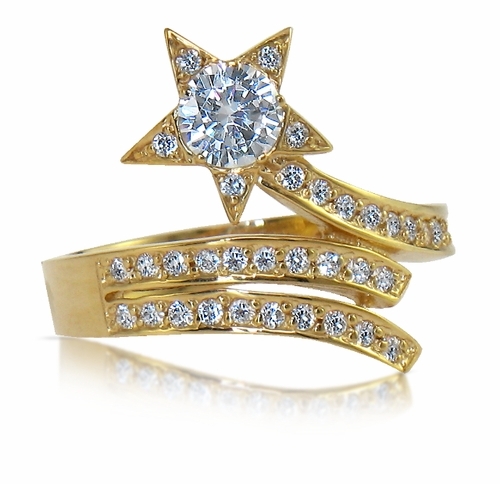 If you love the Chanel star style ring, you are going to adore this Shooting Star Ring! The wonderful star is set with a high quality .50 carat 5mm round Ziamond cubic zirconia center stone and a single pave set round stone to complete each point of the star! Additional pave set round cubic zirconia stones enhance the path of the star to create a feeling of movement and drama. The Russian formula cubic zirconia stones that are set in this ring are all hand cut and hand polished to exact diamond specifications. The shank measures approximately 4.5mm in width on one side and then tapers down to 2.75mm on the other side. The ring features approximately 1.6 carats in total carat weight and is featured in solid 14k yellow gold but can be ordered in 14k white gold, 18k gold or Platinum. This ring would make an awesome gift for the fashion conscious. It can be worn as a statement ring or just a fun right hand ring. A matching pendant is also available, please see item P1175.